I want to share a quiche I made in which I used my darling quiche pan that my youngest son and DIL gave me for Christmas. The raggedy bunny was a gift from my daughter, years ago, as were the bunny and cabbage salt & pepper shakers. My light up bunny bulb was sent from my sister. Won't you stay awhile for a slice of quiche and a cup of tea? Isn't this quiche dish the cutest? It's from Anthropologie and it also came with the cute server that matches. We will use some teacups that coordinate with the colors in the quiche pan. When I made an impossible pumpkin pie last Fall, Judith from Lavendar Cottage, asked if I ever made an impossible quiche. I asked for her recipe and she sent this delicious version to me. Thank you so much, Judith! It is soooo good and reheats very nicely. It's great for brunch, lunch, or dinner! I'm thinking that asparagus and ham with Swiss cheese would be wonderful, too. Cut broccoli up & microwave for 5 minutes. My sweet Harper was with me when I prepared the quiche. She loves being at Nana's! I love Quiche and would love to have tea and try it with you. What a cute little helper you had with you! but all that aside and I bring the star of your post forward...Harper is so adorable, I can't stand it. Kitty, your quiche pan is really cute and I LOVE, love quiche. Without ham though because I'm allergic to it. I have made all kinds of impossible pie with the Bisquick but never a quiche. Hubby never cared for it but now he likes it. I keep trying to get him to eat certain things and now he likes quiche and squash both. Still working on the broccoli although he will eat it, he's not overly fond of it. Finally, getting to that sweet little grandbaby of yours. She's as cute as a button! Nothing like having a sweet little baby in the house. Thank you for sharing and joining me for Tea Time. Have a lovely Easter, my friend. Your quiche pan is too cute. Guess your kids know you like to cook! I love Impossible Pies ... you can make them with just about anything ... my granny would say it includes the kitchen sink. ;) Pretty teacups. But the most precious thing here: the adorable Harper!!! Happy Tea Day and Happy Easter! Oh sweet Kitty, your quiche looks amazing, I adore quiches and the recipe you shared looks very appetizing, wish I had a piece! I am pinning this, though. Now, Harper is the most adorable little helper I've ever seen...hahaha...she's a darling! I also love the dish you got from your Dil. Thanks for your sweet visit, you made my day. Have a very blessed Easter ahead. Thanks Kitty for sharing this great quiche recipe! I love serving quiche to my friends for lunch and this one looks quite easy to make...no difficult crust. Your colorful quiche pan and server are really nice and match well with your teacups. Isn't Harper a cutie in her pajamas! Oooooh! I just want to kiss those darling baby cheeks! I just love your quiche pan, Kitty - that's the prettiest one I've ever seen. Such sweet Easter bunnies, too. I have made the Bisquick impossible pies (just made the bacon one last week), but have never made one this yummy looking! Love the veggies and that little dash of Worcestershire (wow! I spelled that right the first time!). Thank you for sharing this, I will definitely try it. Wishing you a lovely Easter, Kitty ! ! Thanks for the recipe - love trying out new ones. And if it came from Judith we're safe, right? Blessings to you this most Holy Easter Week! Hugs! PS Little Harper is a gem! What a sweet smile for G'Ma!! Wonderful idea to have quiche and the recipe is similar to one I've made using Bisquick! The asparagus idea sounds so yummmy. Your quiche pan is precious and I love the colors and design. It really is a great gift. The most special photo is of your sweet Harper for she is a beautiful child. Have a great Easter and I would love viewing more lovely photos of your darling grandbaby!!!!!!!! Little Harper is adorable. Of course she loves being with her Nana! Love the quiche pan. I have some of the plates that this artist did. Each one so cute! Harper is a cutie, wait until she's a little older and really helping you in the kitchen! Your bunny decor and granddaughter are adorable! Love the whimsical style of your quiche dish. Have a wonderful Easter! What an adorable little angel with the sweet pink flower on her head. I would love to stop by for a slice of quiche and a cup of tea. Wouldn't that be fun! We all love Quiche Kitty! I could eat it several times a week so I am printing out another Kitty special recipe. I adore your grand baby! She's a living doll! What a darling Harper is! I love you quiche pan...I haven't made that recipe for years! Thanks for the reminder! Such a cute setting as well. Thanks so much for linking to Tuesday Cuppa Tea! Cutie Pie Alert! Is she eating quiche yet? Love your special dish and I am sure that Judith's recipe is excellent...if only the real man here would eat quiche. Oh sweet! How I adore your little quiche pan! And this recipe looks fabulous - I just love quiche...it is a perfect for lunch, brunch or whatever occasion! Aww! Such an adorable little one! Look at that smile! Much love and hugs to you, Kitty! Your helper is the sweetest! I like the sounds of this recipe! Will be printing and making it for sure! Kitty, gorgeous quiche AND quiche plate and server! I'd love to have a slice of quiche and a cup of tea with you! Harper is adorable! I just love spending time with my new grand daughter. She is only two me months old and they were here lastnight for dinner. I'm still cleaning up since holding her was what I really want to do when they come over. I have less time for blogging now. Your quiche looks so delicious and I must try it for dinner. 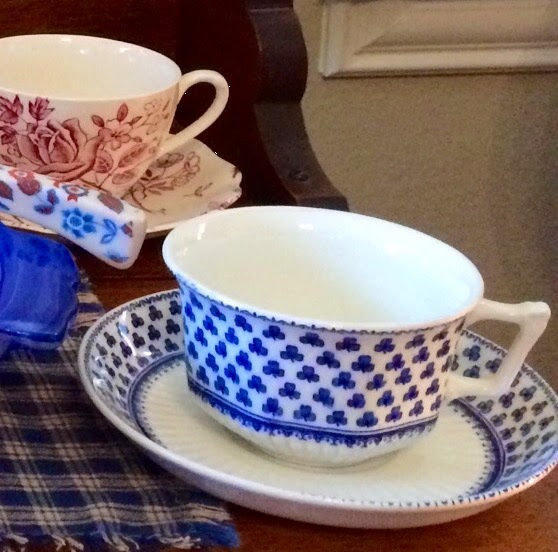 I love the two teacups that you have featured and the one that you won in the teacup exchange is very pretty! Happy Easter Kitty! Blessings, Kitty. What a darling little girl! She is such a sweetie-pie! Your quiche looks delicious, and what a gorgeous dish. Love all the bunnies popping up everywhere, so cute. If I don't "talk" to you beforehand, have a blessed Easter, dear friend. Mmm...that quiche looks sodelicious and I love the cute pan...and the bunny to :) The recipe sounds really easy ...just might be trying that real soon! Thanks and have a Happy Easter! That quiche looks so good! And the dish you used to serve is pretty and cute! Loved seeing your little grandchild. Before you know it, she will be helping you cook your yummy meals. Harper is so sweet, love your bunny in the first pic! Your quiche dish and teacup are all very pretty and springlike. Thanks for sharing. Oh my gosh! That quiche dish is so adorable! Oh does that ever look yummy! I printed the recipe off and will certainly give this a try. Your quiche pan is quite pretty and lovely with your tea cups, Kitty, and that scruffy bunny is adorable! I bet you had a lovely time with your precious Harper. Kitty, that baby girl is so precious! Wait til she is a little older and she will be your best buddy in the kitchen. That quiche pan is the most adorable thing. I love the "impossible" pies, I like to make the coconut custard one for holidays. I love recipes like this Kitty! Harper is a doll bunny! We are expecting a bunny any day! Thanks for the recipe, I had completely forgotten about the bisquick impossible recipes, just like cream soups, too good to be forgotten! Pinning! Hi Kitty! First let me say that Harper is adorable and looks so happy to be with Nana! Your quiche looks just a yummy as the dish suggests! 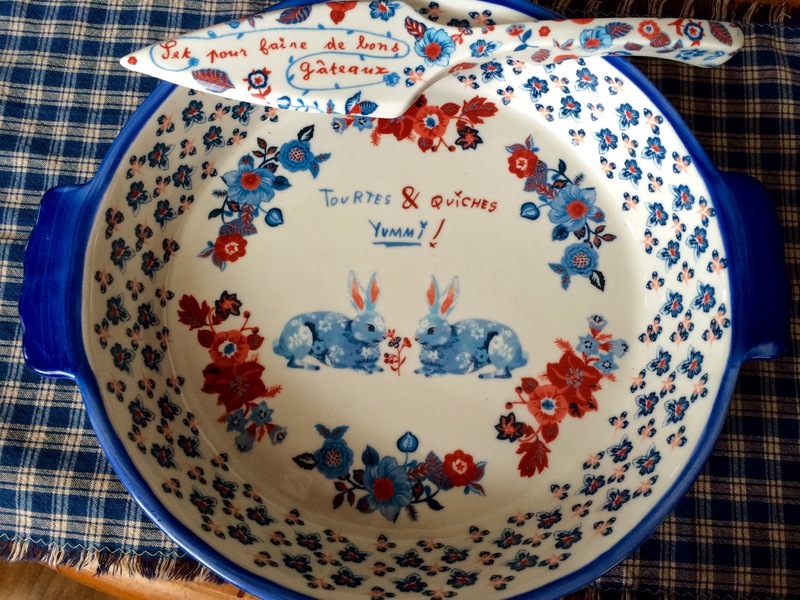 I really like the bunnies inside the quiche dish--too cute. Perfect for a brunch :) Happy Easter! Looks delish. Your helper made me smile. I bet sweet Harper loves being with her Nana :) Anyone would love to be with you, Kitty. Okay, that is one of the cutest dishes I have ever seen! I love the darling bunnies and speaking of bunnies.... the raggedy rabbit is just too sweet. Thank you, my dear, for sharing with Roses of Inspiration. May you have a beautiful Easter! Hugs! Oh, I remember making an impossible quiche years ago. Forgot about it. Thanks for the reminder. It really is yummy! Love your sweet quiche pan and your little Harper is so cute!! Happy Easter and thanks for sharing with SYC. Hope you had a great Easter with your precious little Harper. Your Impossible Quiche in that adorable baking dish would be a big hit here at The Cottage. Thanks so much for sharing with Full Plate Thursday and have a great week.